You are proud of your website and have every right to be. Nonetheless, you still don’t get any orders on your website. 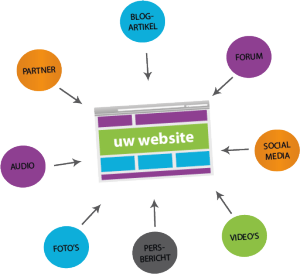 When you have a website, to get found online is one of the essential things you’ll have to realize for your website. The aim of the SEO measures we use, is to achieve the best possible placement in the major search engines (such as Google and Yahoo) for your chosen keywords and combinations of keywords. By some specific optimization measures we can increase the discoverability and thus the visibility of websites in the search engines. Research shows that 97 percent of internetusers are searching for businesses in their own neighborhood. Google shows 75 percent local search results on the first page. Google Places is as you can see an excellent service and marketing option for small businesses. Getting listed in Google Places is more important than ever with the popularity of smartphones. Because your business is also being marked in Google Maps, giving the exact location of your business, customers on the move who are looking for your products and services can easily navigate directly towards your business. With a Google Places listing you can reach those customers who are exactly searching for the products and services your business has to offer. Most businesses don’t have a Google Places Listing, so you’ll be ahead of your competition. Be sure to use images of good quality to make a great first impression on your potential customers. Ask your customers to write a review, so you get found even better online. Let us know when we have to change your company details. We will edit your business details, so your business information is always up to date. Google AdWords is online advertising on Google. The sponsored results will be shown above the organic or “natural” links section and to the right of the organic results. With Google AdWords you’ll reach exactly those customers who are already searching for your products and services. Searchtrends employs serveral Google AdWords consultants. Let us create, manage and optimize your Google AdWords campaigns and we assure you you’ll be running a successful AdWords campaign in no time. Compared to other advertising possibilities, AdWords offers a lot of advantages. Even if you have a small budget, Google AdWords works. You can begin and end your campaign whenever you want. Your advertisements reach exactly the target audience you want to reach. Google AdWords allows you to target specific geographic locations. You only pay when users click on your ads. Every single aspect of your AdWords campaign is measurable. Another advantage of Google AdWords is that you can target mobile device users. You acquire links or referrals from other websites to your own website with linkbuilding. These links can be seen as a popularity vote for your website. In general we can say: the more links you have collected from trustworthy and great websites, the higher your website will rank in search engines like Google. The experts say a good linkbuilding strategy defines for 70 percent if you will rank high(er) in Google results or if you don’t. With linkbuilding, we try to put your website in the center of attention of as many people as possible. If websites post a link to your website more often, your website will get more visitors. The search engine will notice this as well and will conclude that a lot of users think your website is interesting. That is the reason why your website will rank higher in Google results. Searchtrends collects great links for your website from different kind of websites. How do we do this? write and publish online press releases. Linkbuilding is very important to get more leads and more potential customers which leads to a better chance of achieving high ranking in Google. Want to know more? We gladly inform you about your possibilities.